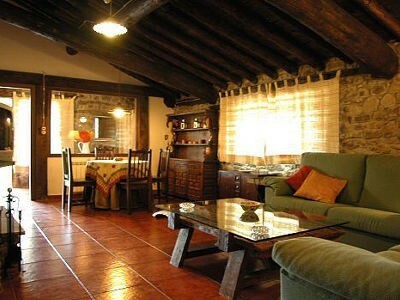 THEY ARE TWO COTTAGES THAT CAN BE RENTED TOGETHER OR DETACHED. . The houses are in the village of Molinos de Razón , in an area of odd beauty on the slope of the Sierra Cebollera. It is in the head of a small valley of fields and forest where there are six small villages of mainly livestock. The valley is surrounded by two rivers, the Razón and the Razoncillo, in a environment of beauty and overflowing nature. Nowadays this valley is part of the Reserva Nacional de Urbión and its proposal the creation of the Natural Park of Cebollera . The area is very quiet, with big variety of flora: Oak, ash, beech, pine, birch, etc.. and fauna: deer, roe deer, wild boar, etc.. If you are looking to enjoy nature ... this is your corner. Rebuilt cottage from the last century. Outside is of stone and inside the wooden old predominate with stone and plaster walls. It has a wide lounge- living room with fireplace and Tv. 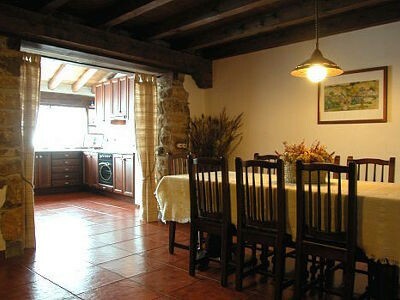 Fully equipped kitchen, 3 double bedrooms (possibility of 3 extra beds), bathrooms, toilet, garage (3 cars). Wide close garden of 300 m2 with furniture of garden and barbecue. Rebuilt cottage from the last century. 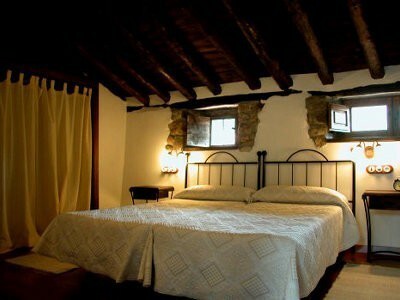 Outside is of stone and inside the wooden old predominate with stone and plaster walls. It has a wide lounge- living room with fireplace and Tv. Fully equipped kitchen, 3 double bedrooms (possibility of 3 extra beds), bathrooms, toilet, garage (3 cars). Wide close garden of 300 m2 with furniture of garden and barbecue. . THEY CAN BE RENTED DETACHED OR TOGETHER. The traditional architecture of the village is one of its appeals, but the biggest one is its environment with tens of paths where you can walk and a forest track which let you to go up to the highest of the Mountain Chain Cebollera and contemplate its small but beautiful glacial lagoon after leaving behind beech, rowan, pine and hazel (which are the closes to the village and where there are mushrooms). The term belongs to the Natura Red 2000 being in the LIC Mountain Chains Urbión and Cebollera, as well as in ZEPA Mountain Chain Urbión, it is also inside of the GR-86 Iberian Path of Soria and of the Regional Reserve of Hunting Mountain Chain of Urbión. The low of the deer in the mountains is other of the touristic appeals in autumn. 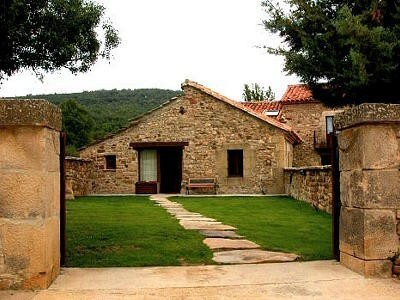 There are two small temples in the village: the parish of Saint Vicente Martyr and the hermitage of Saint Joseph. Black Lagoon, Peaks of Urbión, Ichnites Route, Ruines of Numancia, etc. Hiking, Horse Riding, ATV, Golf, nautical activities in the swamp, Contemplation of the bellowing, etc..